Very dark crimson in colour. Lifted aromas of red fruits, Satsuma plum and blackberry harmonise with hints of bay leaf, sage, rosemary and clove, while savoury complexities and cedar notes lift and add definition. A complex and elegantly structured wine with concentrated flavours of blackberry, spiced plum and wild red berries is layered with nuances of crushed rosemary, bay leaf and black pepper. A seductive mid-palate of great depth and rolling velvety tannins lead to a deliciously long, plush finish. ...Perfumed red of red berry fruits, fragrant pepper and sweet spice, whiffs of liquorice, milk chocolate. Lots going on in perfume. Slides through the palate in a seamless sluice of dark fruits, high toned spice, green herb. It’s a medium weight yet quietly powerful red here. Long in flavour, palate staining, but sleek in a way too…A formidable release. Matured in 18% new and 82% seasoned (82% French. 18% American) oak hogsheads for 18 months prior to blending and bottling. 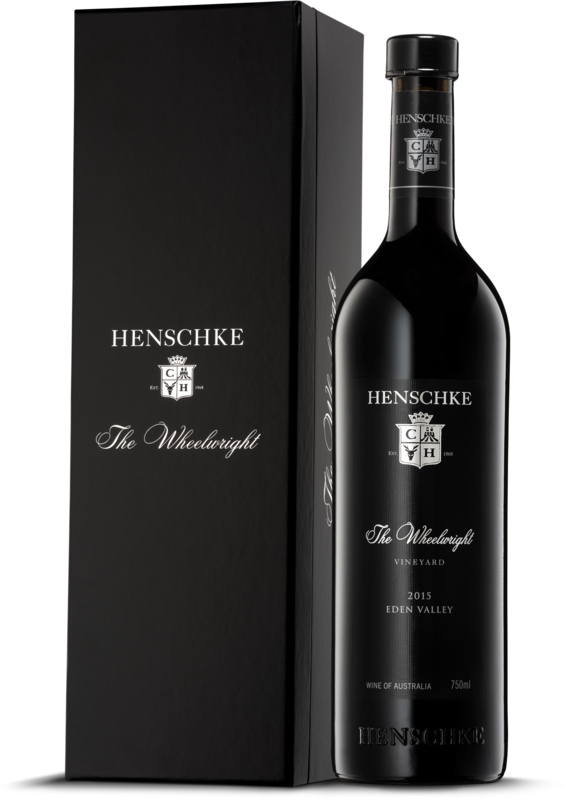 The inaugural release of The Wheelwright commemorates 150 years of family winemaking and pays tribute to the ‘founding father’ of Henschke, Johann Christian Henschke. He was the first generation of the early Barossa German pioneers of South Australia, a winemaker who established the family winery in 1868. Johann Christian arrived as a skilled stonemason and wheelwright and planted his first vineyards in the high country of the picturesque Eden Valley. This wine is produced from Old-Vine shiraz planted in 1968, a century later, by fourth-generation Cyril Henschke. Decanting is recommended before serving. Exceptional vintage, 25+ years (from vintage). perfectly timed for the old dry-grown vineyards. Mild weather followed from February through to April providing a fairytale vintage, eventually winding down at the end of April as the rain and cooler temperatures set in. The 2015 vintage has provided stunning signature regional varieties that show extraordinary flavour, purity of fruit and acid balance with the potential for exceptional ageing. "From Eden Valley vines older than 50 years, this delivers a clear statement of the spicy fragrant and elegantly powerful shiraz produced in this elevated part of the Barossa. Aromas of toasted baking spices, pepper and roasting herbs adorn ripe blackberry and plum fruits. The palate has a very silky, smooth and long flow of fine tannin carrying deeply spicy blackberry fruit to a fresh, scintillatingly juicy and long finish. It can be enjoyed now and for the next 15-plus years." "The Henschke family celebrates 150 years of winemaking this year. To mark the occasion they've released a new shiraz off a block of 50-year-old vines. It's a stylistic fit with Hill of Grace and Mount Edelstone. The fruit comes from Block B on the Eden Valley vineyard, also the source of the Keyneton Euphonium blend. It's a tight, elegant shiraz and umami-laden complexity. The pumice-like tannins are sufficient to warrant cellaring for a decade or more." "This is the first release of this wine from a 50-year-old Eden Valley vineyard planted by Cyril Henschke. It's an immensely powerful wine, with oak playing a more significant role even though only 10 per cent was new. Has a spicy character and is quite different to both Hill of Grace and Mount Edelstone. Sage and bay leaf, with a distinct iron fillings complexity. Mighty good..."
"...Perfumed red of red berry fruits, fragrant pepper and sweet spice, whiffs of liquorice, milk chocolate. Lots going on in perfume. Slides through the palate in a seamless sluice of dark fruits, high toned spice, green herb. It’s a medium weight yet quietly powerful red here. Long in flavour, palate staining, but sleek in a way too...A formidable release." “From the Henschke Eden Valley vineyard on Cranes Range Road, The Wheelwrightis crafted from low-yielding, ungrafted, biodynamically-grown shiraz. At 50 years of age these vines, planted in 1968 by Johann Christian’s great-grandson and fourth-generation Henschke winemaker, Cyril are designated ‘Old Vine’. This vineyard, on ancient red-brown earths, is located at 500m altitude, south of the highly regarded Henschke vineyards of Mount Edelstone and Hill of Grace, and overlooks the village of Eden Valley. The Wheelwright Shiraz has been cool-fermented in traditional, open-top submerged cap fermenters for seven to 10 days on skins..."